Working in IT means working with specialists. The IT world is one with a large amount of specializations (technical, methodological, business-wise), that is still growing every day. The same can be said of many other lines of business and it is even true for non-business area’s like science: it’s a scientist’s job to know a lot about very little. Apparently, the world needs specialists. I would even take it one step further: specialization is probably inherent to economic activity. Every company has specialists employed, and as the company grows, the rate of specialization of the individual employees increases. In a small company, one person can act as a management assistant, sales assistant and takes care of the company purchases. As the company grows, these tasks will be distributed over several persons, meaning they will specialize in a certain activity. This is a normal development, but together with the creation of specialists, another kind of employee is created, the one that is generally called the manager. The manager does not have a specific specialization, at least not at the level of his/her subordinates. The manager’s job is basically about ensuring the several specialists work well together, and contribute efficiently to the objectives of the overall organization. So, seen from this perspective, what would be the number 1 skill for a manager? Communication with specialists. Or more specifically defined, communication with people that know more about a certain ‘area’ than the manager does. This ‘area’ could be pure knowledge (like in science), it could also be certain tasks or activities (like communication with customers). The manager keeps up with the specialist’s skills and knowledge, to a certain level. 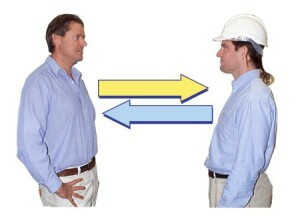 For good communication, a manager must at least know the basics of the area his/her specialized subordinates works in. By experience or by education. Important to add: this could be a continuous process, meaning also a manager may need to attend courses, seminars or other ways to get informed about new developments in specialized areas. A good manager can be recognized by doing this. The opposite is a manager that doesn’t, and eventually he/she will lose contact with his/her subordinates: he just doesn’t know or understand anymore what the specialist is doing exactly. The other thing a manager should do, in order to maintain good communication, is encourage the specialists to communicate about their work with non-specialists. Specialists tend to communicate well with other specialists (especially within the same area of expertise), but in a multidisciplinary company it is essential that they are also able to convey certain information about their activities to non-specialists (like managers or employees of other departments). You may call this collaborating, but basically I’m talking about a certain condition that is needed even before actually collaborating: communication skills. A good manager can be recognized by promoting this. The promotion can be done in several ways, one of them is organizing sessions where specialists tell about their work, about what they do, or about new developments in their field of specialization. The opposite is a manager that doesn’t do this: isolated employees are the result, and it is not difficult to imagine that all kinds of problems will arise: inefficient collaboration in general, problematic projects and miscommunication between management and specialists more particularly. Of course, the above I write based on my personal experience. I try to do both things, whenever I work as a (project) manager or team leader, and it works. I work mostly in IT, and in there I see a lot of miscommunication going on between managers and specialists. Personally, I rarely encounter IT managers that actively try to improve communication, by doing the two things I mentioned above. But the ones that I’ve seen doing it, were quite successful in their jobs. And the ones I’ve seen not doing it at all, well, they basically caused a lot of problems and did not hold their position for a long time. This entry was posted in Communication, management on 15/06/2015 by admin.